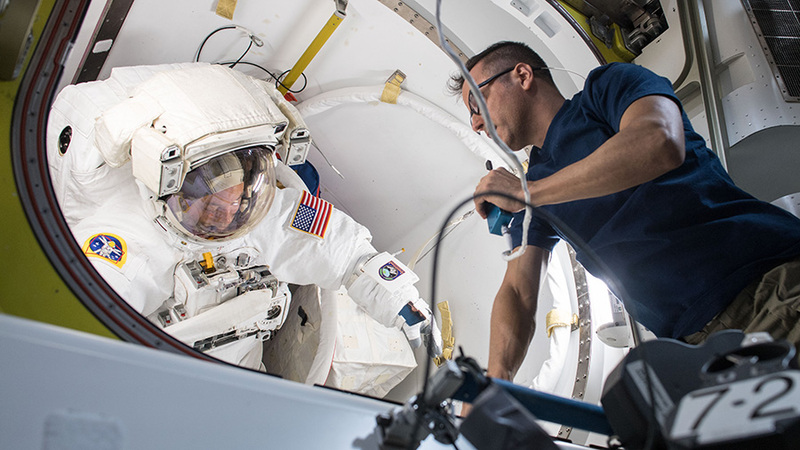 Will there be a replay on NASA TV of this Spacewalk? The Nuclear Magnetic Resonance May Represent as one of Cosmic Rays in The Cold Deep Space Environment . Fortunately NASA testing their Equipment’s and Space Probes in environment Stimulate the space Circumstance before launching, for example NASA has tested a Telescope to endure ~100 days inside a freezing cold cryogenic vacuum chamber that could reach temperatures of -440°F/-262°C to find the capabilities of the duration of its task. Therefore it’s Important to test also to be achieve upon the Spacecraft of Long Space Journeys to be sure that all Equipment’s are ready to do their Functions Properly at the Circumstances of a Cold Space Environment to guarantee their functions Successfully without any failure during The Mission to Mars and beyond. Because at The Temperature -262 most Physical Characteristic of Materials Changes, such Shrinkage, Brittleness​ and even appears a single Magnetic Field of Materials ( Nuclear Magnetic Resonance ), that may have some SIDE EFFECTS in the Spacecraft either directly or indirectly upon the efficiency of equipment and even upon astronaut’s health. Because when a big Mass emitting Nuclear Magnetic Resonance such The External Construction of The Spacecraft, The Fuel Materials, etc. that may create a high intensity of Nuclear Magnetic Resonance, even Planets at extremely​ low temperature may generate a high intensity field of Nuclear Magnetic Resonance. In the meantime this test should be done upon the Spacecraft when all Equipment’s be in The Operation Continuously via a Nuclear batteries inside the Spacecraft which should be able to supply the required electrical storm to operate equipment’s inside the Spacecraft, also astronaut’s room (which preferred to be a Spinning Room to Generate a Centrifugal Force as an Artificially Gravity Force to prevent astronauts any sorts of Health Deterioration due to the lack or losses of Gravity Force ) should keep at the temperature 25 c depending upon the Central Warming of the Spacecraft also to supply The Required heat for all Equipment and Engines to Guarantee The operating Temperature at that Circumstances to prevent any failure due to reduce The Temperature Extremely. Because even Computers and all Electronic Components stops Completely in the extremely low temperature due to INCREASING THE ELECTRICAL – CONDUCTIVITY of the INTEGRATED CIRCUITS AS WELL AS ALL METALS. The Observation should be done for each part of those equipment’s during this test and record data, to find the best Designs for the Equipment’s to be able to do their functions at that Circumstances of The Space Cold Environment Properly. Remember even The Main Engines of The Spacecraft should pass this test Successfully at (The Extinguish Case), then try to use it in a Specific Zone for Engines tests to observe the effects of the Shrinkage of Materials which Create Cracks may guide The Engine to The Failure, to be sure that The Main Engines are reusable during The Return from Mars Mission, in order to find a suitable designs Considering a Required Tolerances and also a suitable Materials have a Suitable Expansion and Shrinkage Factors, Satisfying The Requirements in Cold Space Environment. It’s a long and complex task but it should be done Genuinely to achieve a tasks of our Long Space Journeys Successfully.